Management education begins at McGill University. The Department of Commerce is established within the Faculty of Arts, offering “commercial courses to train people as accountants, clerks, and the like.” A Diploma of Commerce is awarded to students completing the two-year program. The Commerce program is named the School of Commerce. The Licentiate in Accountancy program is first offered, which later evolves into the Graduate Diploma in Public Accountancy. McGill’s School of Commerce is founded, independent of the Faculty of Arts. The first Bachelor of Commerce (BCom) degrees are awarded by McGill in 1920. Executive-level management courses are introduced in the School of Commerce. McGill opens its Graduate School of Business Administration. Prof. Donald E. Armstrong welcomes the first class of the Master of Business Administration (MBA) program. McGill graduates its first MBA class. Businessman and future McGill benefactor Seymour Schulich is one of the graduates. The Faculty of Management of McGill University is established, incorporating the School of Commerce and the Graduate School of Business Administration. 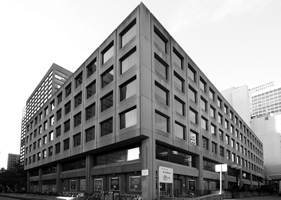 The Samuel Bronfman Building is inaugurated, providing the Faculty of Management with a modern new home on Sherbrooke Street. A generous donation from the Bronfman family makes the building possible. The Faculty of Management initiates a joint PhD program with Concordia University, École des Hautes Études Commerciales (HEC) of the Université de Montréal, and Université du Québec à Montréal (UQAM). The joint MBA/Law program receives approval. Applications begin in 1979. The Faculty establishes the Management Science Research Centre with a capital endowment from the Royal Bank of Canada. The Faculty establishes the Dobson Centre for Entrepreneurial Studies, thanks to a generous donation from the John Dobson Foundation. In an effort to provide a much-needed link between financial market theory and practical investment experience, McGill pioneers the Applied Investments Program, which was the first program of its kind in Canada. The Faculty establishes the Centre for Strategy Studies in Organizations (CSSO) with contributions from Royal Trustco, Imperial Oil, Steinberg Inc., Arnold Steinberg, and the McGill Management Institute. The CSSO is also created with an endowment from Power Corporation of Canada. Chaired by Paul Desmarais Jr. (BCom’77), an International Advisory Board is established to seek management education advice from leading Canadian and foreign business leaders. The McGill Institute of Marketing (MIM) is launched, providing an active forum to exchange and cross-pollinate ideas and expertise in marketing. The Faculty launches three new programs, all of which are Canadian “firsts”: the International Masters Program in Practicing Management (IMPM), the Joint MD/MBA program, and, in conjunction with the McGill Faculty of Engineering, the Masters in Manufacturing Management (MMM). The John E. Cleghorn (BCom'62) Distinguished Teaching and Research Chair in Management Studies is established. The Faculty launches the MBA Japan program, the first Canadian degree program offered in Japan. McGill opens the Power Corporation International Executive Centre on the sixth floor of the Bronfman Building to offer students of the McGill Executive Institute improved education facilities. The Canadian Credit Management Foundation endows a chair in Integrative Health Management. The McGill Centre for the Convergence of Health and Economic (MCCHE) is established, forging an unprecedented worldwide alliance of scientists, food-industry executives, health care leaders and policy markers. The Faculty launches the Advanced Leadership Program (ALP), marking a new generation of executive education. McGill’s MBA program celebrates its 40th anniversary. The Desmarais Global Finance Research Centre, made possible by a donation from the Desmarais family, is established. 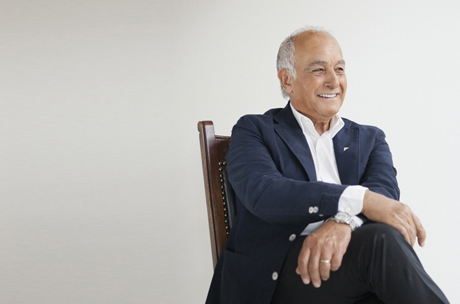 Herschel Victor (BCom'44), Chairman and CEO of Jack Victor Ltd., a men’s clothing manufacturer, makes a generous donation to renovate the lobby of the Bronfman Building. The lobby is named in his honour. On November 17, the Canadian Credit Management Foundation and Dr. Marcel Desautels CM, O.Ont., LLD’07, donate $22 million to the Faculty. The gift allows our Faculty to invest in the MBA program curriculum, renovate facilities, enhance career services and hire new professors. It is the largest single donation ever made to a business or management faculty in Canada. The Faculty is named the Desautels Faculty of Management of McGill University. The Faculty launches the International Masters in Health Leadership (IMHL). The Faculty evaluates and redesigns the Graduate Diploma in Public Accountancy. The Expert Panels are formed with top level executives from around the world in the areas of Investment & Risk Management, Marketing & Entrepreneurship, Technology & Innovation Management, and Global Strategy & Leadership. Another $10 million donation from Dr. Marcel Desautels creates the Marcel Desautels Institute for Integrated Management (MDIIM) and contributes to the formation of the innovative Integrated MBA curriculum, a new, cohesive direction to the Faculty under the integrated management approach. The Faculty launches the bilingual joint Executive MBA (EMBA) program with HEC Montréal. The Faculty evaluates and redesigns the Honours in Investment Management option in the BCom program. The joint International Business Families Centre, between the Desautels Faculty of Management and HEC Montréal, is launched, offering bilingual services for family enterprises in Quebec and Canada. Another research centre, the Program for International Competitiveness, begins operations to harness and distribute knowledge in the fields of globalization, strategy, innovation, and firm competitiveness. The Faculty launches the NSERC-CREATE program. The first-ever Hot Cities of the World Tour begins, taking BCom and MBA students to Israel. The interdisciplinary Major in International Management is offered at the BCom level. The MBA program becomes self-funded, allowing us innovate and invest in the right areas and solidify our position among the world’s top MBA programs. The Faculty evaluates and redesigns the Professional Part-Time MBA and MBA Japan program under the integrated management umbrella. In partnership between staff, academic members, students and the International Advisory Board, the Faculty undertakes a strategic planning initiative, resulting in a more clearly defined vision for future Faculty endeavors in the years 2011-2015. The Québec Ministry of Education approves our MBA as a distinct international program within Quebec, allowing us to be the only MBA in the province to be self-funded while forgoing government subsidies, giving us increased flexibility and self-reliance. Desautels MBA students Mohammed Ashour (MD-MBA), Shobhita Soor (LLB-MBA), Jesse Pearlstein, Zev Thompson and Gabe Mott triumph over 10,000 applicants from around the world to win the 2013 Hult Prize of $1 million toward their social enterprise (sponsored by the Clinton Global Initiative). The MBA program introduces a mandatory International Study Trip to enhance its globally-oriented curriculum. The full-time class visits Tokyo, Japan, and the part-time class heads to Buenos Aires, Argentina. The European Foundation for Management Development (EFMD) grants the Desautels Faculty of Management the European Quality Improvement System (EQUIS) accreditation for a five-year period. New gift from Dr. Marcel Desautels lays the groundwork for the MBA Next 50 campaign. 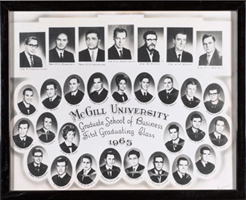 2015 marks the 50th anniversary of the first graduating MBA class at McGill. Read about the campaign launch and how the Faculty celebrated this landmark anniversary. Top Impact Maker Seymour Schulich, proposes that the new MBA Building be named in honour of Professor Don E. Armstrong, PhD’54 (1925-2011), founder of our MBA. In response to the need for a program that integrates advanced financial concepts and quantitative methods with real-world business practices, the Desautels Faculty of Management launched the Masters of Management in Finance (MMF) in February. As a pre-experience, 12-month program, the MMF welcomed its first cohort in the summer of 2016. The Desautels International Advisory Board, pictured with Dean Isabelle Bajeux-Besnainou, has championed the new building and future home of the MBA. At their last meeting, the Board posed under the announcement of the future home of the MBA and Masters programs. MBA Campaign update; announcement that the new MBA Building will be named in honour of Professor Don E. Armstrong, founder of our MBA. Thanks to a donation of $25 million from the Bensadoun Family Foundation, announced in May 2017, McGill begins work on developing the Bensadoun School of Retail Management: an inter-disciplinary, state-of-the-art school dedicated to all facets of the retail industry. 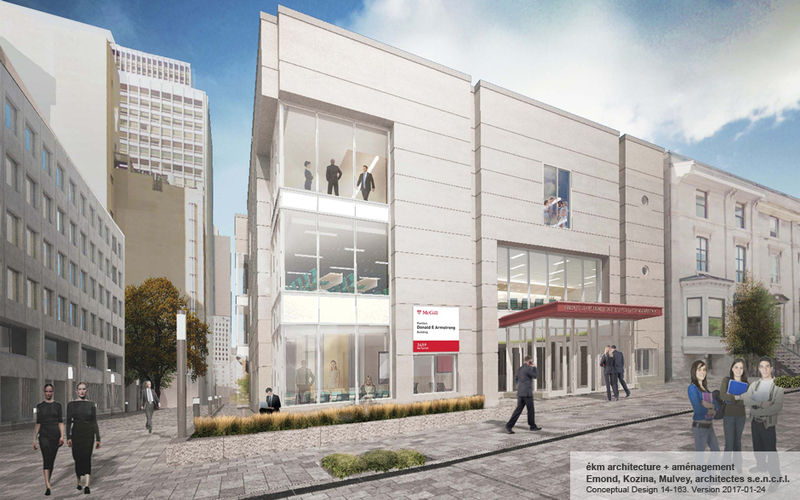 In 2018, the Bronfman Building will include an addition to the Ground Floor with the new Bensadoun School of Retail Management. The MBA & Specialized Masters programs move into the new Armstrong Building named for Professor Donald E. Armstrong, PhD’54 (1925-2011). The 48,666 sq. ft. expansion brings new dedicated teaching and learning spaces that benefit all in the Faculty. While the building opened for students as of January 2018, the grand opening took place over May 25-27, 2018. In response to the growing needs of organisations (for profit, non-profit, governmental) for business analytics, the Desautels Faculty of Management launched the Masters of Management in Analytics (MMA) program in 2018. The MMA degree is a pre-experience, twelve-month specialized program in the evolving field of management analytics. The MMA welcomed its first cohort in the summer of 2018. The European Quality Improvement System (EQUIS) Accreditation Board rendered its decision to re-accredit the Desautels Faculty of Management for a five-year period – the maximum term granted by the European Foundation for Management Development (EFMD) through EQUIS. These historical notes were last updated on June 26, 2018.